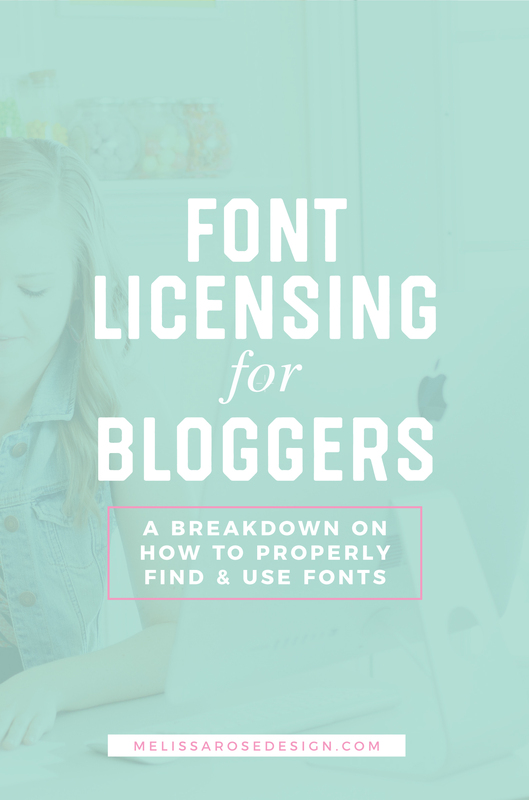 When it comes to choosing fonts for your blog’s branding or graphics, the waters can get muddy when sorting through all the free & commercial use licensing out on the wild web. While you may find a font that is advertised as “free”, that doesn’t always mean that you can use it in your blog’s graphics for free. So today, I’m going to walk through some of the different font terms to help you navigate the different font websites and how they should be used. C) Are paid, commercial Use fonts. But what if you are just starting a blog with the intentions of monetizing it, but haven’t made a penny off of it yet? Here’s how I see it. If you have a blog online that wasn’t just created to update your family on your child’s life events (strictly personal), then it’s classified as a business (or potential business). This would mean that you cannot use “personal use only” fonts for your blog’s branding or graphics. So if you’re already using 2-3 fonts that you found for free online, you will want to go back and check those licenses to ensure you are using them legally. SIL Open Fonts are fonts that are 100% free for personal and commercial use. We’ll consider these “fonts for the greater good”. Fonts that are out there so that anyone can have access to basic fonts. Sites such as Font Squirrel and Google Fonts are an example of SIL Open Fonts, so any font you find in either of those databases are able to be used commercially at no charge. So a good rule of thumb is if you find a font online that you like, pop over and do a search on Font Squirrel or Google Fonts to see if the font is in their database. If it is, you’re good to go. – Free to use for both personal & commercial purposes. – No hassle trying to decipher licensing, since they’re all safe to use. – The fonts are more basic and limited (i.e. serif and sans serif). You’re not going to find trendy new script fonts as SIL Open Fonts. – Not recommended to use script fonts from Font Squirrel as your logo/primary font, because they are often outdated or overused. – Like any site, you still need to sort through a bunch of “meh” fonts to find ones that look professional & fit with your branding. – Because of their availability, these fonts can sometimes look “generic” unless they are utilized throughout branding in a way that makes them look unique. – SIL Fonts work better for secondary/accent fonts in your branding rather than using them for your main logo. Because everyone & their mother has access to these fonts, unless you’re a designer who can custom modify the shapes & characters of fonts, SIL Fonts typically don’t have as much uniqueness/character to them that I believe a logo needs. “Personal use only” fonts are exactly what the name describes. These are fonts that you can use free of charge for anything that does not fall under commercial practice. So if you’re a blogger, you don’t want to use personal use only fonts for your blog’s branding or graphics. Instances where you could use personal use only fonts would be a poster for your kid’s school project or a birthday invitation that you made for your sister’s bridal shower. But let’s say that you design those bridal shower invitations, everyone raves about them, and then you decide to throw the design up on Etsy to sell. At that point, you would need to purchase a commercial license for the font (assuming a commercial license is offered) or swap it for a free font that includes a commercial license. You’d also need to check the license to make sure you are following the font’s specific terms in regards to your product, as there are sometimes restrictions to mass-produced designs & products, as well as restrictions on redistributing fonts (i.e. you can’t send that customer the font file itself). If you’re doing a Google search for “free fonts” a majority of them are going to be “Personal Use Only”. A website like Dafont is a good example of this. While they do have fonts on there that can be used commercially, you’ll see that many are listed as “Personal Use Only” next to each one. They’re “free” but they’re also only for personal use only. Dafont also has a lot of fonts listed as “Demo” fonts. Think of these as test fonts – designers put these out there kind of like a “try before you buy” type of thing. If you end up wanting to use it commercially, you need to purchase a license. For this reason, I recommend skipping Dafont for your blogging font hunting purposes. While there are some on there that are free for all purposes, you probably aren’t going to have much luck finding a nice, professional, commercial licensed font on there…for free. Also, because each font has its own type of permitted license, you really need to be diligent in checking the terms before downloading/using. I personally don’t have the time or the will to sit through & try to decipher different designer’s terms, so I steer clear of sites like this. – Great way to test out fonts on your computer. But be sure that if you end up using them on your blog in any way, you need to purchase a commercial license. – Cannot use commercially, unless you find and purchase the license. – Takes more time & effort to ensure you are using legally. You need to be diligent in reading the licensing terms, as each font on Dafont has different terms. Be sure to click on each font for the full description before downloading, as often times it will state the terms (like this). If that information isn’t listed, don’t assume it’s free. It is up to you to check the designer’s website or contact them directly for clarification on terms (see Dafont terms here). – Because of their availability, these fonts aren’t always the most professional in terms of their overall look & letter spacing. – If you’re a blogger, steer clear of fonts that say “Personal Use Only”. If you are in love with a font that says this, hunt down the designer’s info as they will often list the cost for a commercial license on their website. – As a designer, I don’t use sites like Dafont because A) many of the fonts on there are often overused and B) in my opinion, they are not always the most professional fonts. Many look juvenile and unless you are trained in typography & can pair them well, it’s very easy for these kinds of “display fonts” to look cartoony and messy. That’s not to say there aren’t well-designed fonts on Dafont, but in my experience, those are the exception, not the majority. Like I’ve been talking about, when it comes to choosing fonts for your blog, commercial use fonts are what you need. Although there’s an array of licensing jargon you can get into, there are typically 2 main types of commercial fonts. Fonts that include the rights to use it commercially, for free (like I mentioned before with Font Squirrel & Google Fonts). Fonts that include a commercial license, for a set fee. So other than price, what’s the main difference between the two? Why the heck would you spend money on something that you can find for free? Well, it basically comes down to these three things. Selection, quality, and uniqueness. Like I mentioned earlier, places like Font Squirrel & Google Fonts are a great place to find basic, simple fonts that work great as secondary fonts throughout your branded materials. What I mean by “basic” is that most of the fonts are standard serif or sans serif fonts. While they do have some scripts, the selection is limited and they aren’t always up to date in terms of trends. As a designer, I’ll often use a selection of curated serif & sans fonts from Font Squirrel for things like logo taglines or as part of Pinterest graphics for clients. These are not the main fonts that are used in the logo, but rather the “accent” fonts. Since the fonts are free for commercial use, using them in templates means that the client doesn’t need to purchase a license to use them. They can simply go to the website and install their own copy to their computer. The other main type of commercial fonts are ones you have to pay for but are often the ones I recommend if you are truly looking to establish unique branding. Like anything in life, “you get what you pay for” and often times you will get more unique, better quality, and professional fonts when you are willing to spend a little bit. And in this instance when I say “quality” I am referring to the way in which the font was set up by the designer. If you’ve ever typed out a word using a font and all of a sudden it looks like some letters are super close together & some are way too far apart, that is a direct result of how much time & detail went into that particular font. High-quality font designers will have spent an insane amount of time ensuring that spacing in between letters is consistent. The other pro to using a paid font is that it is will naturally be more exclusive. Unlike free fonts that are circulated around the web in .2 seconds & used in tons of graphics, paid fonts hold more exclusivity (ie. fewer people are usually using them). – Paid fonts are more usually more exclusive since not everyone & their mom has free access to them. – In the grand scheme of font land, Creative Market is an affordable option (ranges typically between $12 – $25/font). – Having to commit to paid fonts can help you nail down your brand look (i.e. no more wishy-washy, use #AllTheFonts in your blog graphics). – This is the only place I purchase fonts these days for 3 reasons. 1) They sell mostly all fonts that I come across on Google or Pinterest. 2) All the terms are the same, so I don’t have to try & keep track of all the different font’s terms. 3) I can keep all my fonts in one place so that if I need to download them again, they are all right there. * Note: if you purchase commercial fonts from sites other than Creative Market, make sure to read their terms. Not all commercial licenses are created equal & like I mentioned before, some restrict how you can use them for digital/physical products that you are going to sell/mass produce. So when might you look into purchasing a commercial font? If you are looking for a larger selection of unique, professional fonts for your logo, graphics, or marketing materials. If you have locked down your brand’s style guide & are ready to commit to using your set 2-3 fonts. There is more I could elaborate on with fonts, but I’m going to leave it at this. I know navigating this world can be overwhelming, but when in doubt, I say to always contact the font designer or in the case of Creative Market, contact their support team. Our job as online business owners is to support other online business owners (aka font designers), and ensuring we are using fonts properly is the only way to do that. Don’t use “personal use only” fonts for anything blog related. You can find free, SIL Open Source commercial use fonts on sites like Font Squirrel or Google Fonts. Great for basic serif/sans serif fonts to use as secondary fonts. For more exclusive, unique fonts, check out sites like Creative Market. Great selection & affordable pricing. I know this was lengthy, but hopefully it helped clear up some of the unknowns when it comes to using fonts for your blog & branding! If you have any questions, feel free to leave them below but also remember that I’m not a lawyer and can’t answer every question related to fonts. So again, if you’ve got a specific question, reaching out to the font designer is always your best bet! Disclaimer: This post is not intended as legal advice. Your situation may be different from the facts assumed in this post. You should not rely on this post as the only source of information to make decisions about your use of licensed fonts and intellectual property.